The genus Mycobacterium comprises a variety of species, including species from the MTB complex (Mycobacterium tuberculosis, M. bovis, M. bovis "bacillus Calmette Guerin", M. africanum, M. microti, M. pinnipedii). The cell wall structure corresponds to the gram-positive bacteria, but with an additional high lipid content with characteristic mycolic acids. The term "acid-proof" based on the fact that do not discolor stained cells using a mixture of acid and alcohol. To the culture of mycobacteria special media are required. Usually it is an airborne infection pathogens reach beyond the upper airways in the lungs; the incubation period of six to eight weeks (positive tuberculin skin test), but also longer. Approximately five to ten percent of those infected develop an infectious disease. 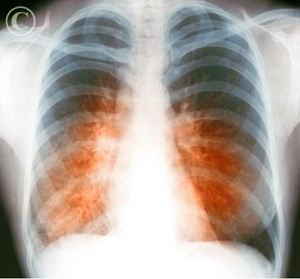 The disease manifests itself in the majority of patients pulmonary tuberculosis (primary complex), but it can also all other organs (usually secondary), including the central nervous system are affected. Due to the intake of dairy products of the intestine is primarily affected in diseases due to M. bovis. The onset of pulmonary tuberculosis is uncharacteristic, usually characterized by a chronic cough, rarely tinged with blood. In addition, weight loss, fatigue, low-grade fever, night sweats and other symptoms. Occasionally fall to enlarged lymph nodes in the neck. In the context of immunosuppression (alcohol abuse, HIV, immunosuppressive therapy) may lead to a generalization resettlement of pathogens in other organs including the central nervous system; the fulminant course with high mortality is called Landouzy sepsis. In a progressive disease, lung nodules decompose cheesy, it caused caverns with destruction of lung tissue. Involved here are particularly immunocompromised patients, eg Alcoholics or patients of advanced age. It is important to endogenous reactivation of persistent pathogens; in countries with high incidence and exogenous reinfection. For the prevention of infection of additional people quicker initiation of therapy and isolation of infectious persons are inevitable. Proved the DOTS strategy has (directly observed treatment, short course), ie the six-month controlled combination therapy. In addition, an active case search in contacts, including from countries with high prevalence or risk populations (prisoners, the homeless, etc.) is essential. In the hospital isolation of patients is necessary, the duration depends on the success of therapy. Important additional information on preventive and control measures can be found in the leaflet of tuberculosis RKI. A therapy should be carried out individually, as the default is now independent of the infection, the combination of isoniazid (ISOZID etc. ), rifampicin (EREMFAT etc. ), pyrazinamide (among others PYRAFAT ) plus ethambutol (EMB-FATOL etc.) or streptomycin (Streptomyces-Fatol etc.) in the first two months, followed by INH plus RMP on another four months. At full sensitivity of the strain as well as in children may also be sufficient triple therapy (INH, RMP, PZA). For the treatment of patients with resistant isolates is a number of other drugs, such as Fluoroquinolones such as moxifloxacin (Avelox), as well as injectable substances such as amikacin (amikacin Fresenius), kanamycin or capreomycin (both in Germany not commercially) available also here an individual regime is necessary. 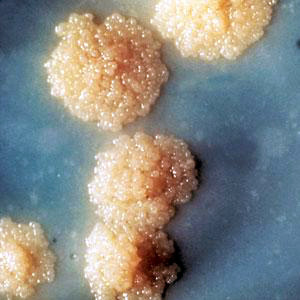 Extremely resistant strains of tuberculosis (XDR-TB) are resistant to INH and RMP and in addition there against a fluoroquinolone plus against one of the injectable Substanzen.4 reporting obligation pursuant to Section 6 IfSG (illness, death) and P7 (detection of acid fast bacilli, pathogen detection, sensitivity determination) to note is also P34 (employment in community facilities). To diagnose a not manifest infection, the tuberculin skin test (Mendel Mantoux- method) is traditionally used. The interpretation of the test is difficult in some cases, since false positives (eg cross-reaction with other mycobacteria) and false negative (eg, immunosuppression) results are possible. Of the tuberculin skin test, by an interferon gamma release assay (IGRA) are complemented, depending on the assay with a specificity of 70 and 90%, wherein the release of interferon-g under the influence of specific antigen is measured. However, a positive test alone does not prove disease, a distinction between active and latent tuberculosis is also not possible! As before imaging techniques for diagnosis and for monitoring the development are essential. Microscopy: The detection of acid fast bacilli in materials of the respiratory tract is indicates the presence of infectivity to note, however, that other (non-pathogenic) mycobacterial species and dead bacterial cells can lead to a positive result. Culture: Study materials are primarily respiratory secretions, gastric fluid, tissue, pleural fluid, cerebrospinal fluid or urine. Used solid and liquid specialty media with incubation for at least six weeks. A study on mycobacteria is always explicitly request. Nucleic acid amplification Detection of DNA or RNA of live and dead cells with a sensitivity between 80 and 90%, a distinction between M. tuberculosis complex and other mycobacteria is possible. The indication exists always in addition to culture - particularly in severe diseases, immunosuppression and infants.